It’s great to see director Luc Besson, whose credits include La Femme Nikita and The Fifth Element, trying his hand at mob comedy with The Family. Starring Robert De Niro, Michelle Pfeiffer, and Tommy Lee Jones, the feature is now out on Blu-ray. If you love Besson’s trademark mixture of comedy and action, this flick doesn’t disappoint. Along with the easy and amiable chemistry displayed by the film’s principals, The Family’s biggest asset is its visual look. Besson once again works with top notch cinematographer Thierry Arbogast, and even though cinema has mainly been supplanted with digital filmmaking, the pair decided to shoot most of the film on 35mm with Kodak cameras. The special features include the trailer as well as a quick, humorous segment that spotlights the vulgarity used in The Family. The Family featurette, though just 10 minutes, covers a ton of ground. Besson’s work with the actors is seen throughout the segment, which also features quick interviews with the movie’s principles. 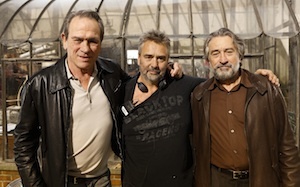 Besson was initially set to serve as the movie’s producer and screenwriter, but when assembling the A-list cast, the temptation to direct was much too strong, so he relented. Michelle Pfeiffer’s role was expanded once she landed the part. Footage of co-stars D’Leo and Agron meeting for the first time is also in the segment, and D’Leo initially thought Agron was part of the movie’s crew members, and not her co-star. The Family (136 minutes, R, Twentieth Century Fox Home Entertainment) is now out on DVD and as a Blu-ray Combo Pack (the featurette, as well as the DVD, are among the extras contained the pack).